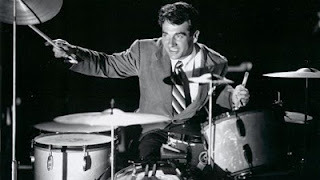 Gene Krupa -- nourishing himself. I knew: It was Saturday morning. He was in his jammies. Cartoons were on. Sloth was calling. I pointed out that he sometimes complains about going but always has a good time when he is there. He acknowledged this and grumpily pulled on his uniform. He went. He had a good time. He returned to glorious Saturday sloth. While the boys were at karate, I stepped out in the the rainy gloom to load my drums into the car for that night's job. I was grumpy. I didn't want to leave the warm house to go out into the fog and drive for half of an hour to a crowded room where I would be until two in the morning. I wanted to stay home. I looked up at the iron clouds as I loaded my bass drum into the car. My winter breath rose up toward them. To my surprise, the clouds slowly took the shape of my father (he's very much alive, by the way, but this is too dramatic to pass up) who looked down upon me and slowly shook his puffy-cloud head, little ribbons of cottony moisture twirling in wisps to disappear into the gray ceiling. "Dad? What the hell are you doing up there?" "Don't worry about it. What's your gripe?" "I don't want to play tonight." "No I don't -- wait. Seriously, how did you get up there?" "I said don't worry about it. Anyway, you do want to play tonight -- you just don't want to drive, set up and break down. You know that once you get there, you will have a good time. You love playing the drums." "Okay -- I have to go," he said. "Your mother is calling me." With one last dubious glance skyward, at the now-faceless sky, I finished loading the drums. That night, I played. My mysterious cloud-father was as right as I had been with my advice to my son about karate. I enjoy playing drums. It was a good night, despite the fog and the drive and the set-up and break-down. 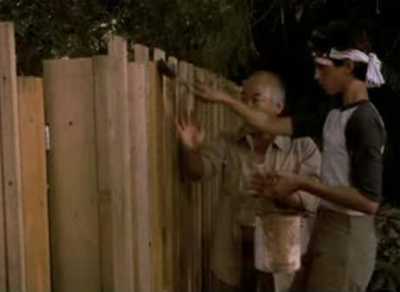 Paint the fence. LAME! Karate? HUZZAH! ...except when you're playing. For that time in-between the first four stick clicks and the last cymbal hit of the night, I know I'm in a good place. I'm a musician. Musicians make music -- not because they want to, but because they have to; because they need it the way other life-forms need daylight. That's the core of it. Maybe many of us get lost in some un-articulated hope that the core of things will bleed out into the whole of things. Maybe we feel disappointed in our lives because we expect certain arrivals to be paradise when all we can really ever hope for are oases in the desert of reality. Let's face it: gardens of plenty don't grow in sand. Sure, going to karate stinks. Being at karate is great. Going out to play drums stinks. Playing drums is great. All the peripherals of dream X stink. But that little spot where the lines of the letter X cross? -- that's the oasis. You need a sit-down gig. 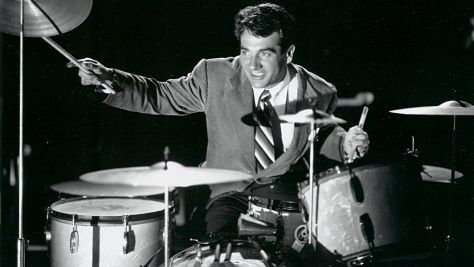 Drummers need them more than most musicians, what with the kit and the cymbals and the accoutrements of percussion, like those tinkly chimes, for example, that you run your stick across. Do people still smoke cigarettes in clubs in your part of the country? Or has it been outlawed? That was often a downside, breathing in second-hand smoke, even in the nicer supper clubs, when playing in such establishments some years back. No, Elsa Louise -- thank goodness, there is no smoking in clubs around here anymore. I cannot tell you, by the way, what a difference it has made in how I feel the next day. Back in the smoking days, I assumed how awful I felt after a normal night of playing was just the way it was. As soon as they stopped the smoking, it was nothing short of miraculous how much better I felt. You need to get back out and play! Also, I have always wanted to get me some of those tinkly chimes. Glad to hear it. Seemed as if it might be the case now. And cheers not only for the band, but I always used to feel for the wait staff, too. How tough to spend all those hours surrounded by the haze of smoke. For me, the idea of singing again is a pleasant one. A little nightclub, a pianist, a drummer, a bassist. A sweet quartet doing a couple of sets. The play list? Pretty out of date, as to current rep but could always easily perform tunes from the standard American songbook with such an ensemble. Do get those little chimes. They are indeed so cool. Such a small sound that adds so much. I say do it! And may I put in a request for some Johnny Mercer? Actually, I do have have chimes, but electronically. They;re not as cool as the real ones. As the wife of a drummer, I know this struggle all too well! It's even worse when he goes out on tour for a week...and yet, he continues to do it, God bless him. The pull of the X spot is strong. Your point is well taken, though -- I personally struggle a lot with the work involved in most of my hobbies, (I end up questioning my passion based on my desire NOT to do the work) so it's a good reminder that you don't HAVE to love all aspects of your craft. Hi, HC -- yeah, I would hate to reduce life to "don't expect too much," but counting on dream careers or achievements is a lot like marrying someone because you expect them to make you a happy person... You have to do that stuff yourself. As artists, we, too, have to be careful of asking too much of our art-forms. In short, there is a crappy aspect to everything, however much fun it might be.